J&K Police Recruitment Special Police officers (SPOs) in SDRF J&K. Invites application for various SPO posts. Applications as per enclosed proforma are invited from the permanent residents of J&K State (Male only] for their engagement as SPOs (Skilled) in SDRF J&K as per the directions of PHQ-J&K against the monthly honorarium as admissible in terms of policy for such engagements. JK Police invites applications for engagement Special Police officers (SPOs) in SDRF. All the interested candidates can apply for the various vacant positions in the J&K Police. The Jammu and Kashmir Police published vacancies for jobs aspirants of J&K. Interested Candidates must possess Post Matric (10th ) or any higher/ equivalent qualification pass from an institute recognized by the State Government to apply for the same post. All the Interested candidates apply offline on or before 10th NOV 2018. 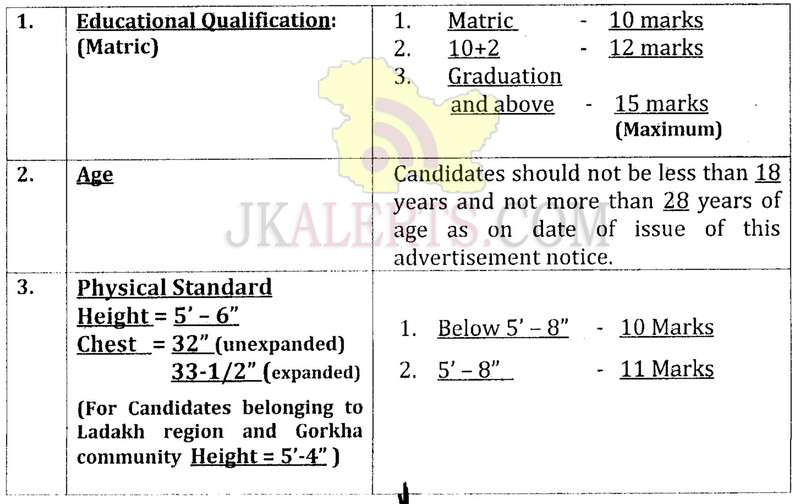 Jkalerts will provide you the complete detail about this J&K Govt job notification like Eligibility criteria, How to apply Online, Important dates, Age limit with relaxation, post by category, Selection process & official notification. So interested candidates are requested to read it carefully to apply for SPO Jobs in J&K Police. Candidates should not be less than 18 years and not more than 28 years of age as on date of issue of this advertisement notice. “Application Forms” completed in all respect shall be deposited in the office of Commandant SDRF 1st Bn. and Commandant SDRF 2nd Bn. at Srinagar and Jammu respectively under proper receipt The incomplete application forms or not filled properly shall not be entertained. The candidates of Leh and Kargil shall deposit their application forms in the office of Dy.Controllers Civil Defence Leh and Kargil respectively. 1. Date of Birth Certificate (Matriculation! The last date for receipt of application forms is 10th Nov. 2018 (4:00P.M). For J&K Police (JK Police, Jammu and Kashmir Police) Upcoming jobs notifications Selection Lists and Results update Free Job Alerts and Updates for both Fresher and Experienced Candidates. Keep Visiting Jkalerts.